The food is a trap. Well, not entirely. 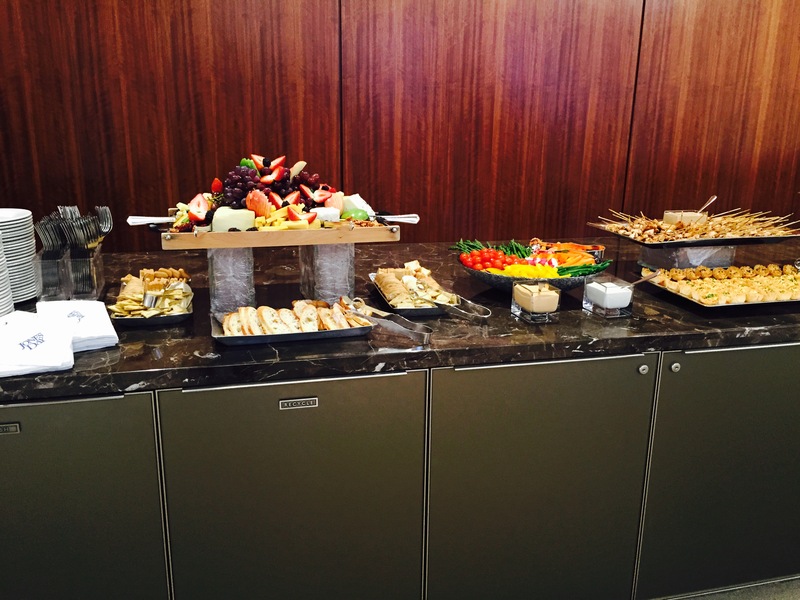 You see, whenever you go to a networking event, you’ll see delightful, delicious, and most importantly, free food laid out all ready to be eaten. We college students are adept at eating anything that doesn’t run away from us, so the temptation is almost unwieldily at times. But you must resist! I don’t know why these employers torture us with food we can’t possibly eat in a polite way, but I know that you too will be faced with your culinary kryptonite (for me, it was spare ribs), and have to just say no. Because as the title of this post says, they can totally tell if you just came for the food. Let me give you a couple of scenarios to help you figure out how to enjoy the bounty without enjoying it a little too much. Please note: I have unfortunately witnessed all of these things happen at real events to real people. Scenario 1: You have a late class (e.g., after 4:00 p.m.) and have to book it to make it to a firm’s meet-and-greet downtown…with no time to eat anything. At the event, you see the spread of food which includes authentic lobster rolls, oysters, tiny pork chops, and a mac and cheese bar. Your stomach is practically eating itself, so the minute you walk in the door, you make a beeline for the food table and post up there for the next 30 minutes stuffing your face, not realizing that in the process you have ignored every attorney in the room and spilled very white mayonnaise on your very black suit. Oh, and that one attorney you really wanted to talk to? They left the event early to tuck their kids in. Lessons learned: Try to eat before you go to an event to prevent yourself from thinking with your belly rather than your head. One-handed foods only — if it needs two hands to eat without making a mess (like a lobster roll), it is unfortunately not okay to eat at a networking event. Do not hover around the food table for more than a couple of minutes; better to make several trips than to be seen there for the entire event. Choosing to “eat then network” may be more hurtful than helpful because attorneys tend not to stay for the entire event and may be gone by the time you’re finished eating. Remember that these organizations get food catered all the time and chances are that there are replenishments for any food that goes quickly (i.e., there will be more crab cakes). Scenario 2: You have pleasantly discovered that most networking events serve drinks. Seeing that one of the options is your favorite brand of pinot noir, you immediately ask the bartender for a glass. The first glass helps you unwind and feel less nervous about the whole networking thing, so you have a second. Because you have followed (most of) the lessons in Scenario 1, you have also only been eating tiny, non-filling foods like cheese and crackers and mini egg rolls. You are now not only mildly intoxicated when you shake hands with the hiring partner of the firm, you also greet him with a deep purple, toothy smile. Lessons learned: Again, EAT BEFORE YOU GO; if you don’t eat, you don’t get to drink. If you do choose to drink, the rule of thumb is one-and-done, so be sure to nurse any drink you get for a while or be ready to switch to water. Red wine is not your friend and will stain your teeth — unless you can be sure to check yourself before you go interact with other attorneys, stick to white wine, beer, or just water. Scenario 3: You managed to avoid both of the pitfalls of Scenarios 1 and 2, and have decided that the most efficient way to consume the free food/alcohol is to have them at the same time. You load up a modest plate of finger foods and hold it in your left hand, and grab a glass of white wine in your right. Ready to take on the networking world, you have a friend introduce you to the attorney they were speaking with. The attorney goes to shake your hand, but you don’t have one free. You instead offer them your elbow. Lessons learned: You can eat, or you can drink, but not both at the same time. UNLESS the firm has kindly set up standing tables which allow you to set your food and drink down, in which case, feel free to free your hands and speak to attorneys at the table. If you do not have a hand free, don’t try to introduce yourself to anyone — be they a student or an attorney. Scenario 4: Through no fault of your own, though you read this post and did everything you could to prevent it from happening, you are starving and need to eat something at this event or risk passing out. The firm has provided tables, but no one seems to be using them and everyone is congregated on the other side of the room, mingling. Resolved not to faint, you hunker down at a table, alone and completely segregated from the other eventgoers, and try to eat as quickly as possible so you can rejoin the group. Lessons learned: Network with a wing person. When it’s time to meet people, it reduces the awkwardness you’ll feel when you first start networking; when it’s time to eat, you won’t be alone. I know some of these tips sound less than fun, but they really will help you to remain professional around the people who could be your employers and colleagues someday. Keep these tips in mind when you start going to networking events, and try them out at the networking opportunities at orientation! And remember that if you really have to, you can always pick up a burger or ice cream or chicken wings (again: all foods I torturously abstained from at networking events I’ve been to) on your way home. I’m rising 2L, but check out my posts about things I wish I knew as an incoming 1L so you’ll actually know them when you get here. My inbox is always open so you can comment on here, or shoot me an email at ochogo@bc.edu.